OK, this beastie is unusual. What would you say about a machine that was mostly hand built and will zap you with mains voltage on any metal surface? Seriously. 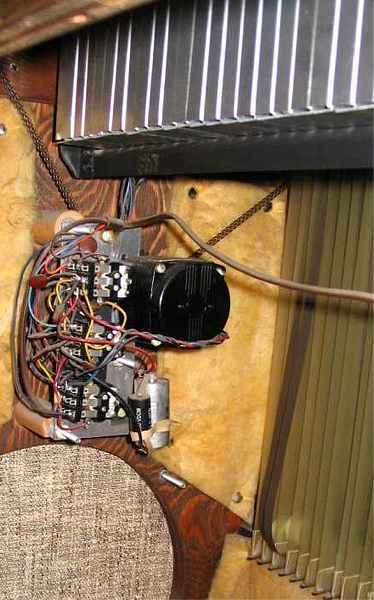 Well, at least it sounds better than your regular Mellotron...if it doesn't burn down the house while doing so. It was a privilege to have been invited over to the Q Division studios to view this instrument (thanks, guys!). Previously I'd only seen pictures from an EBay auction, but now here was the real deal. 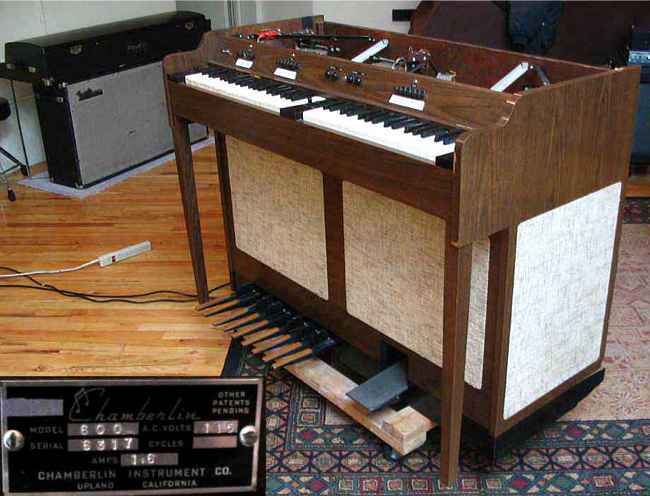 For those who don't know, the Chamberlin Music Master was the model for the Mellotron Mark I. 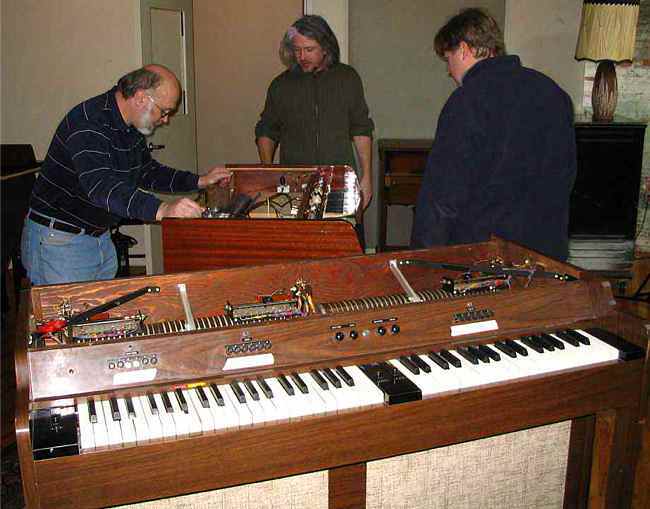 The story goes that Bill Fransen brought two Music Masters from the US to the UK where the machines were reverse engineered to get ideas for the "Fransen" (thank goodness that name didn't stick). 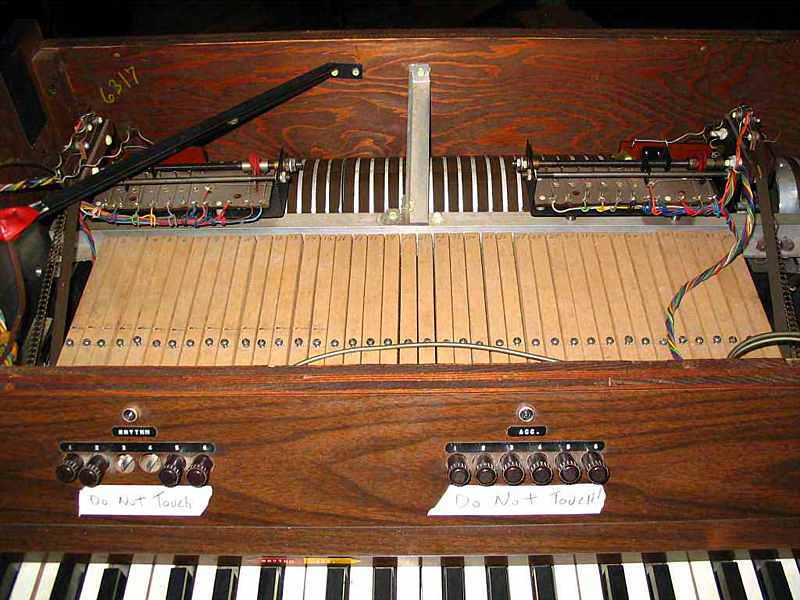 After the designers in the UK were done, we had the Mellotron Mark I. Looking at the Chamby versus the Mark I there are distinct similarities, but there are differences. One is less of a fire hazard than the other for starters! But I'm getting ahead of myself. Let's take a closer look at the Chamberlin. THREE cycling stations. The left hand keyboard is split between B2 and C2 where you have rhythm and accompaniment stations. The right hand keyboard has lead instruments. There are 40 keys on the left side (15 rhythm, 25 accompaniment), 35 on the right. Cycling is controlled by what works out to be a relay-driven analog computer. 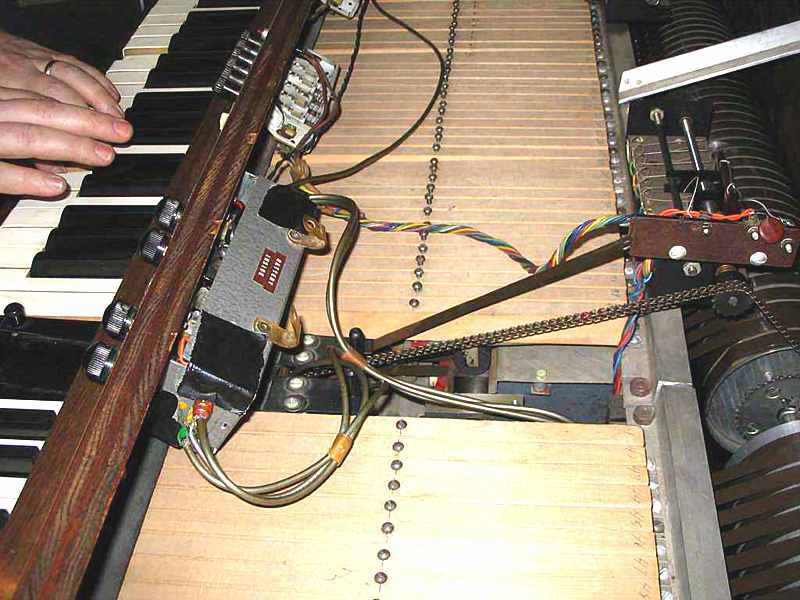 Picture 1: When you change stations, a motor and chain drive are activated, just like the Mellotron. 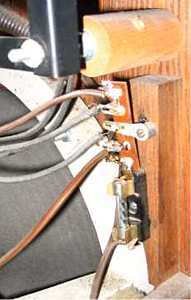 A bolt turns as the drum turns, and a sleeve moves along the bolt to note what station is active. 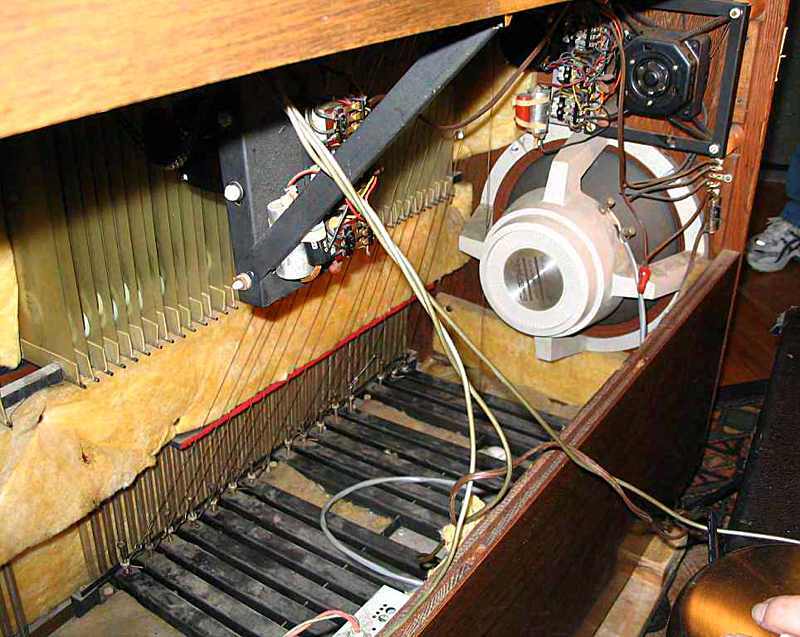 This is similar to the sweeper dial on the Mellotron. Near the bottom of the picture you can see a tape, but it's not a pulse tape. Instead there's a slot cut into the tape where electrical contact is made. Picture 2 + 3: The center (2) and right hand (3) stations are pictured with their cycling computers. You can see the chains, too. In the third picture you can see the tape take-up box at the top of the picture. Note in picture 3 that one tape is slack. The chain drive for cycling is unreliable and skips, as the chain is not every robust and doesn't seem to fit on the gears all that well. The result is slack tape. The folks at Q Division cycle the machine by hand now to avoid any problems. What you don't see in the pictures is the mains voltage. 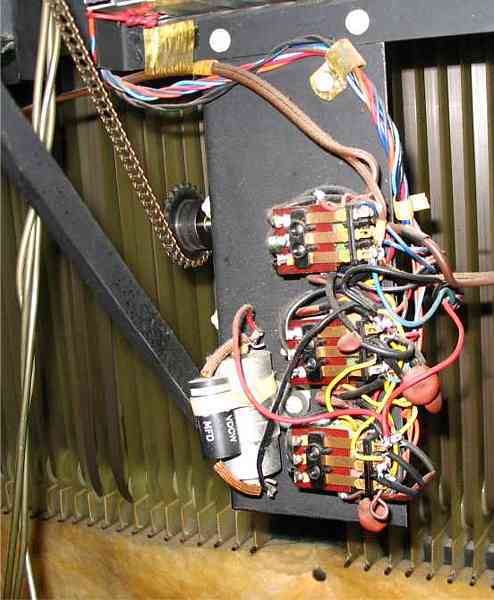 There are NO transformers in the machine; everything runs at 110V. This voltage is applied liberally all over the metal in the machine. Yes, you do feel it if you touch anything metal inside the box. There is absolutely no way this machine would ever get a UL safety listing. No way. Foot pedals. See the black strips in the picture? 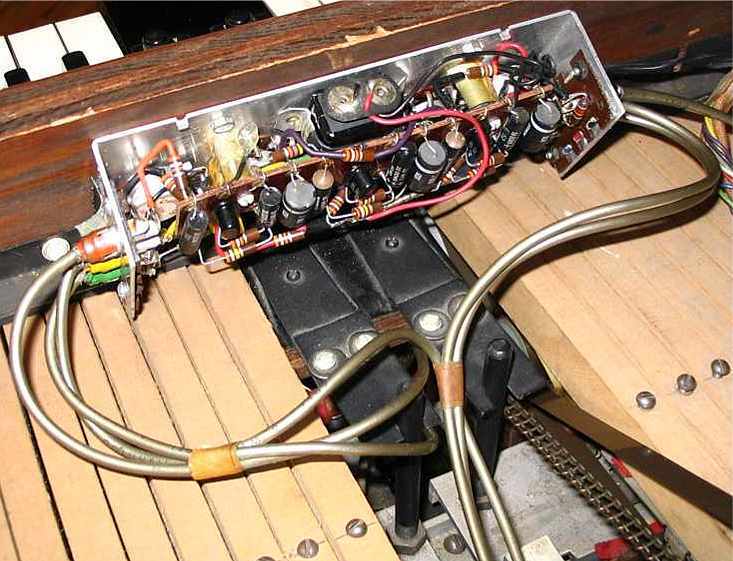 Those are the foot pedals. 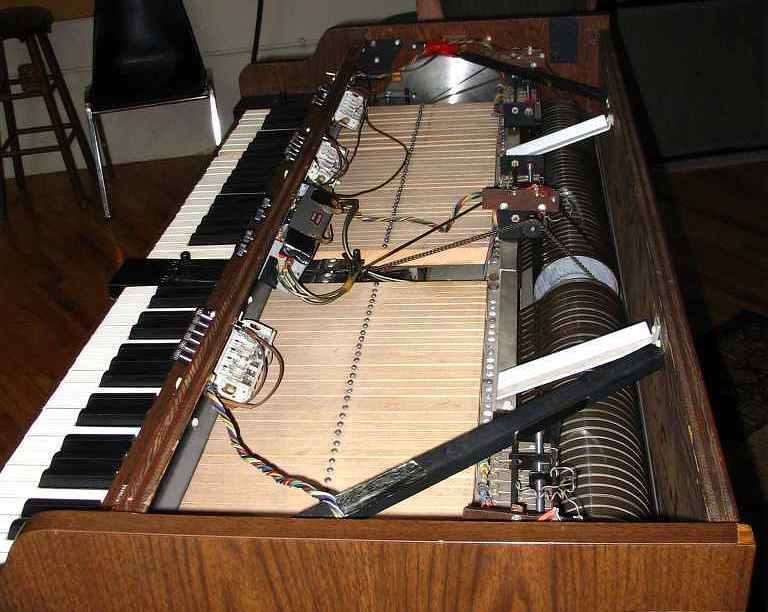 Wires go from the foot pedals up to the rhythm keys on the keyboard. If you press down a foot pedal, the corresponding key is pressed. You can play the rhythm keys by the keyboard or the foot pedals. 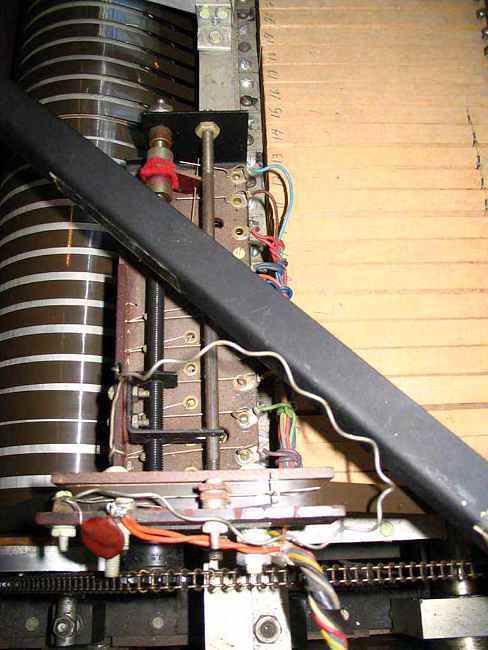 A phonograph motor. Harry was a wiz at putting these together with anything off the shelf. 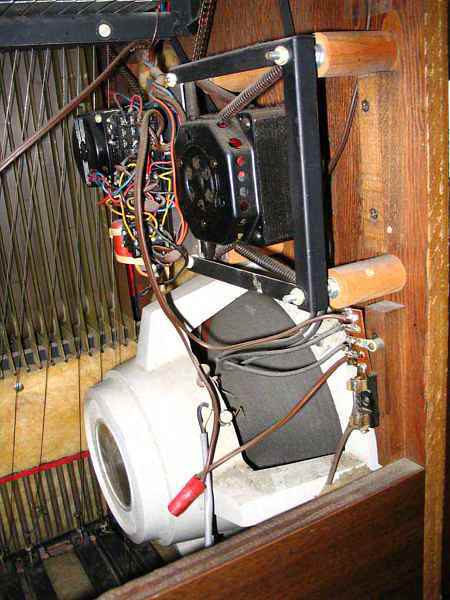 We believe the main drive motor to be a motor from a phonograph. Mains voltage comes in, gets split, powers everything. Insulators? Naaahhh, we don't need no steenkin' insulators! And, yes, those are wire nuts. A battery-powered transistor-based tape preamp. No, not kidding. These were either harvested from something or made very simply. Basically there are three transistor-based amps in here with a 9V battery. Remember: there is no transformer in the machine, and you can't exactly power tiny preamps like this from the mains voltage. So you supply your little dry cell, and off you go. Foot pedal for volume control of the main amp and a reverb. Harry purchased an off-the-shelf home stereo amplifier, took what he needed, attached a reverb tank, and put it into the bottom of the machine. He added a foot pedal for a volume control. Unfortunately the amplifier is not in the machine at this time and may be lost. No matter, as Q Division normally runs this direct from the tape preamp. 3-track, 3/8" tape. 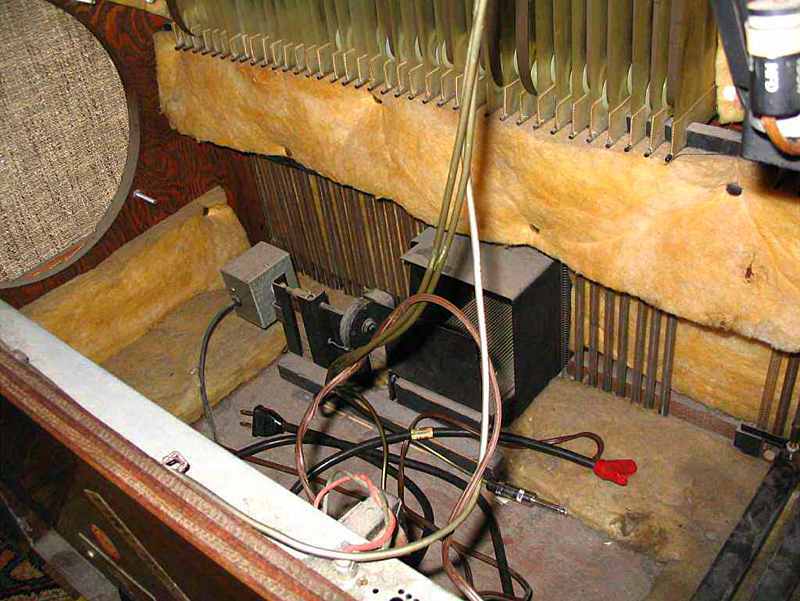 Harry's tape path is very similar to the Mellotron's. Track select, though, is done by a lever, and this is something Harry had in pretty much all of his machines. 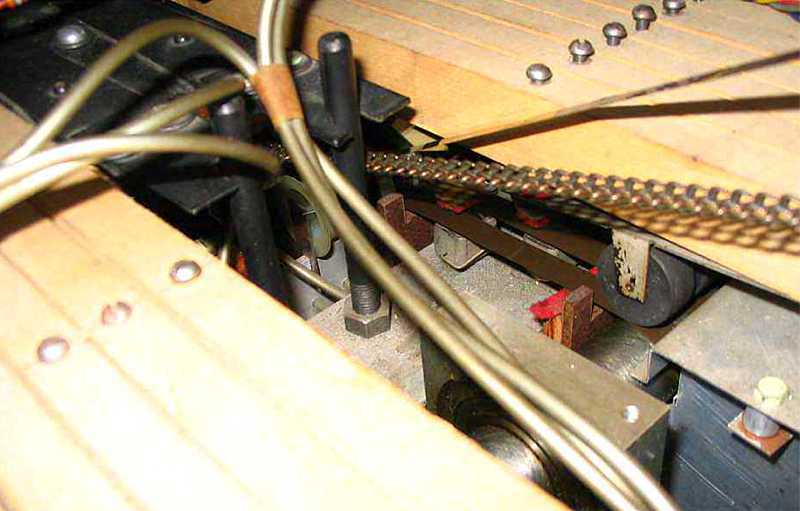 You'll note the puck (pinch roller), very similar to what you find in all Mellotrons. What is missing is the adjustment screws for the pressure pads. Only the pinch rollers can be adjusted.